Tiene hambre? (Are you hungry?) This combo lunch plate with 1 tamale, rice and beans with chips was a bargain for $5.75 including a can of soda. 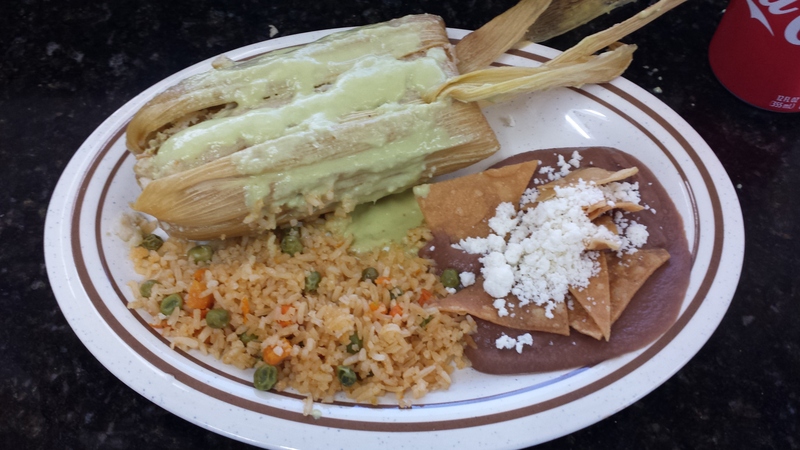 Tamales Dona Tere #1 at 8331 Beechnut Street in southwest Houston offers the lunch special every day. Customers choose a chicken, pork, sweet or other kind of tamale with verde or red chile sauce at this tamale restaurant that offers single person seating along its windows and takeout. This entry was posted in Celebrations, Dining, Food, Houston Restaurants, Houston Texas Dining and tagged Hispanic Heritage Month Food, Houston Tamales, Tamales Dona Tere #1. Bookmark the permalink.